Luigi Galvani an Italian scientist, while cutting a frog’s leg his steel scalpel touched against one of the frog’s nerves and the leg muscles jerked. The leg twitched. He called this Phenomenon as animal electricity. Galvani then believed that this electricity is inborn or natural for living beings including man. He was then honored for the discovery of bioelectricity. But later Alessandro Volta disagreed with his discovery. He did the same experiment and was able to reproduce the same result. Although Volta got the same result, he was not satisfied with Galvani’s statement. Volta said that it was the two different metals which made the legs jerk. Volta then conducted another experiments to prove this. He prepared a stack of copper and zinc of alternating layers which was separated by a paper or cloth dipped in salt water mixture. In this experiment the zinc loses electrons and thus oxidation reaction takes place. These electrons are then received by the ions in water and thus reduction reaction occurs. This is the basis of a cell or battery. Alessandro Volta invented electric battery. It was first named as Voltaic Pile. For his contributions to science, the unit of electric potential is named as Volt. Later scientists improved on Volta’s design. The voltaic pile could not deliver currents for longer periods. Then John Frederic Daniell developed Daniell cell. Thus he avoided the corrosion issues of Volta’s invention. Then George Leclanche invented Wet cell and Dr. Carl Gassner introduced the Dry cell battery. Scientists substituted the chemical solution with dry cells which was filled with chemical paste. Here again the metal oxidizes and both oxidation and reduction reactions take place. Electric current was not fully looked into up to the time batteries were designed. Dry cell battery is one of the most commonly used type of battery in these days. Gaston Plante introduced the first rechargeable battery. It is the lead-acid battery and is again most common application found in cars. A cell is a device that maintains the potential difference which exists between the two electrodes due to chemical reaction. A collection of two or more cells which are connected in series or parallel is called a Battery. Thus we will obtain the required voltage or current. A battery is an energy source that converts chemical energy to electrical energy. It is otherwise known as electrochemical cell. The energy is stored in the form of chemical energy inside a battery. Batteries give us a convenient source of energy for energizing devices without cables and wires. When it is connected to a circuit it produces electrical energy. A battery consists of two terminals – A Positive and Negative Terminal. The Positive Terminal is called Cathode and the Negative Terminal is called Anode. They are also called as Electrodes of a Cell. These electrodes will be dipped in a solution called electrolyte. It is liquid which is ionic and conducts electricity. The output voltage of battery depends upon the elements used as electrodes, the size of the electrodes and the type of electrolyte used in it. When the battery is about to charge, an external source is connected to it. The anode of the battery is connected to the negative terminal of the source and cathode is connected to the positive terminal of the source. As the external source is connected to the battery, electrons are inserted into the anode. When the cell or battery is connected to the circuit chemical reactions takes place. Thus chemical reactions take place within the two electrodes. Here oxidation and reduction reactions happen. Then reduction reaction occurs at cathode and oxidation process occurs at anode. The cathode acts as the oxidizing agent by accepting electrons from the negative terminal anode. The anode acts as the reducing agent by losing the electrons. Thus due to these chemical reactions an electrical difference occurs between the terminals-anode and cathode. When there is no power the electrolyte prohibits the movement of electrons directly from anode to cathode. This is why we are using an external source or connecting to a circuit. Thus electrons travel from anode to cathode when the circuit is closed. Finally it gives power to the appliance which is connected to it. After a long time when the electrochemical process alters the anode and cathode materials it stop giving out electrons. Then the battery dies. A cell or battery can be divided into several categories like primary cell or battery, secondary cell or battery, reserve cell and fuel cell. A primary cell cannot be charged again and so it can be used only once. The chemical reaction will be irreversible and the active materials may not return to their original forms in primary cell. Dry cells, alkaline cells and mercury cells are the different examples of primary cells. Primary cells cost low and can be used easily. It is not suitable for heavy loads. The secondary cells can be charged again and it can be reused again and again. The chemical reaction in secondary cell is reversible. Lead acid cell and fuel cells are examples of secondary cell. Lead acid cell is used widely in vehicles and other applications which requires high value of load current. The car batteries and stand by power sources are secondary cells. Solar cells are secondary cells that converts sun’s light energy into electrical energy. Though the cost of secondary cell is higher compared to primary cell, primary cell can be used for a long period of time. The usage of secondary cell is more complex. Cells can be connected both in series and parallel ways in a circuit. For the cells connected in series it produces a greater resultant voltage. The cells which are damaged can be easily identified and hence can be replaced easily as they break the circuit. If any one of the cell is damaged in the circuit, it may affect the whole connection. The cells which are connected in series gets easily exhausted and so they do not last longer. It is not used in house wiring. If the cells connected in parallel and any one of the cell is damaged in the circuit, it will not affect the whole connection. The cells which are connected in parallel do not exhaust easily and thus they last longer. The voltage developed by the cells in parallel connection cannot be increased by increasing the number of cells present in the circuit. It is because they do not have same circular path. In parallel connection the connection provides power based on one cell. So the brightness of the bulb will not be high. It is possible to create our own battery at home using potatoes. 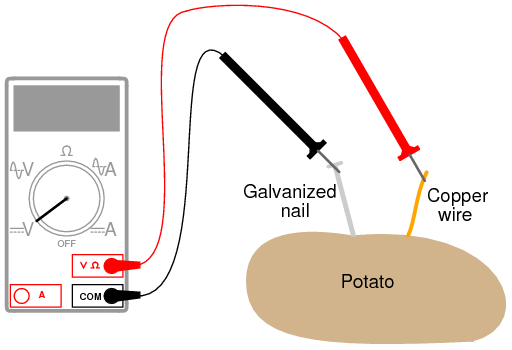 For this experiment we need a potato, a galvanized nail, copper coin, two alligator clips and a voltmeter. Galvanized nails have a zinc coating. Take a fresh potato because the result of experiment depends on juice of it. Insert the galvanized nail into the potato somewhat at the center. Next insert the copper coin into the potato which should be slightly away from the galvanized nail. Now one clip to the copper coin and voltmeter is connected to one lead. The second clip is connected to the galvanized nail and the next lead is connected to the voltmeter. Then check the reading on the voltmeter. There will be slight increase in voltage. The juice of potato act as an electrolyte in the experiment and zinc in the nail reacts with copper. Thus a chemical reaction takes place. We can power a clock by using potato batteries. It is also possible to light bulbs using potato battery. We can also generate electricity using lemon battery. Internal Resistance is the resistance which is present within the battery that resists the current flow when connected to a circuit. Thus it causes a voltage drop when current flows through it. It is the resistance provided by the electrolyte and electrodes which is present in a cell. 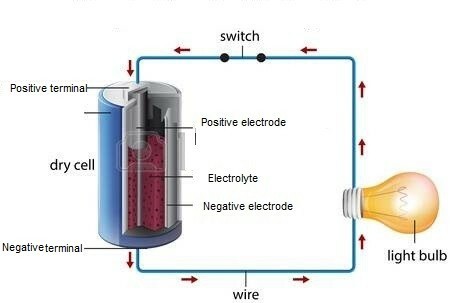 So Internal resistance is offered by the electrodes and electrolyte which oppose the current flow inside the cell. Consider the circuit given below. 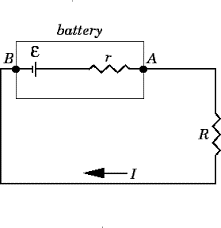 The cell can be modified with an emf ε and the internal resistor with resistance r which is connected in series. An external load resistor with resistance R is also connected across the circuit. The terminal potential difference represented as V is defined as the potential difference between the positive and negative terminals of the cell when current flows through the circuit. So V = ε – Ir, where V is the potential difference across the circuit, ε is the emf, I is the current flowing through the circuit, r is internal resistance. Alessandro Volta invented electric battery which was first named as Voltaic Pile. A cell is the one which maintains the potential difference that exists between the two electrodes due to chemical reaction. When two or more cells combine together it becomes a battery. It converts chemical energy into electrical energy. A battery consists of two terminals which is a positive and negative terminal and also knowns as Electrodes of a Cell. The positive terminal is called Cathode and the negative terminal is called Anode. These electrodes will be dipped in a solution called electrolyte. When chemical reaction takes place oxidation occurs at anode and reduction occurs at cathode. A cell or battery is divided into two main categories like primary cell or battery and secondary cell. A primary cell is used only once and secondary cells can be used more than once. Cells can be connected in series and parallel in a circuit. We can make batteries at home with the help of potato, lemon etc. EMF or electromotive force is the potential difference developed between the two terminals of a battery in an open circuit. ε = E/Q, ε is the electromotive force, E is the energy and Q is the charge. Internal resistance that exists within the battery resists the current flow when connected to a circuit.